Saturdays 4-6pm Beginners @ Satsanga 30/32 Labourdonnais Street, Puducherry. Monday 7th Jan : exceptionally no intermediate class. No partners required. Please bring socks or dance shoes. 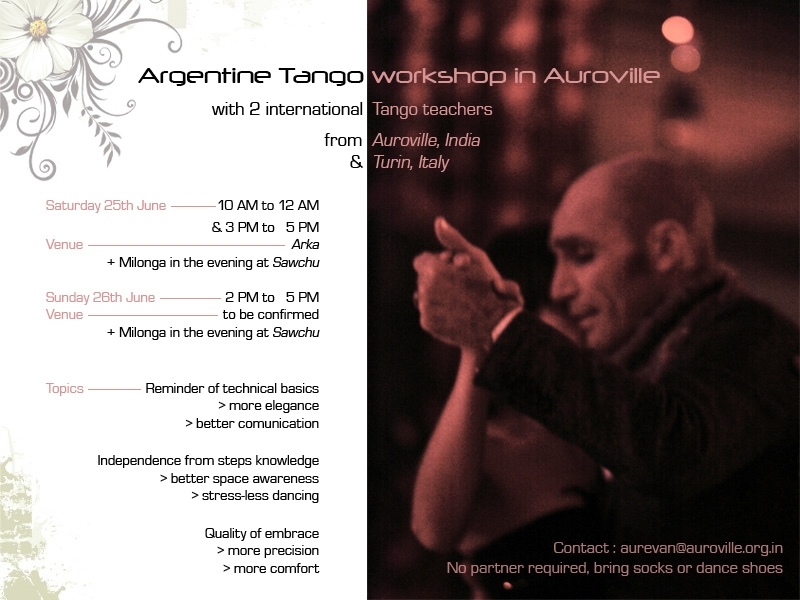 Over a year ago Argentine Tango arrived in Auroville. People from different countries meet here and have now started dancing Tango together. New dancers – with or without experience – are most welcome to join. We are dancing during the week (small workshops) and organise special weekend workshops and milongas. NO PARTNER REQUIRED. PLEASE BRING SOCKS. Today, on Thursday, 1 July 2010 will be a milonga/ practica with some experienced International tango dancers. Bring along your dance shoes, some tango music and tango friends and have fun with Shivanand (Bangalore), Aurevan and International Tangueras y Tangueros from Auroville who are visiting Bangalore and desperate to dance with you!